Twenty years ago I lived around the corner from the Hong Kong Go Association in the Wan Chi District of Hong Kong. Returning to Hong Kong last fall, I discovered that the HKGA had moved. After some investigation, I was able to find the new location in the Kowloon District. During my first visit I was amazed that a search of a card file revealed my membership at the old location! 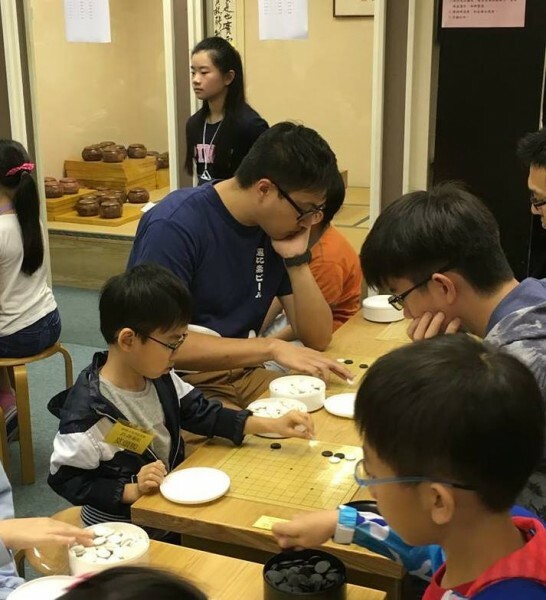 Some things were the same: I was the only non-Hong Kong native who regularly played; players were friendly and welcoming, often despite the absence of a common language; and counting was usually by the Chinese method. The major difference was that Friday evenings, rather than Saturdays and Sundays, were the best times to find a lot of players and games against opponents of various strengths. My nemesis, a 13 year old named Matthew, was a regular on Friday evenings and we had many enjoyable games. Unlike twenty years ago, when most games seemed to involve big dragons fighting to the death, games seem to show more style now and players usually spend time going over completed games to improve. Hours: Tuesdays through Sundays, 2 p.m. to 10 p.m.
Fees for non-members: HK$20 (about US$2.50) on weekdays; HK$40 on weekends and public holidays.